After Islamic insult on Hindu temple in Malaysia, Violence breaks out, Vehicles set ablaze. Violence breaks out near Hindu temple in Malaysia after insult by Muslims, vehicles set ablaze at random. 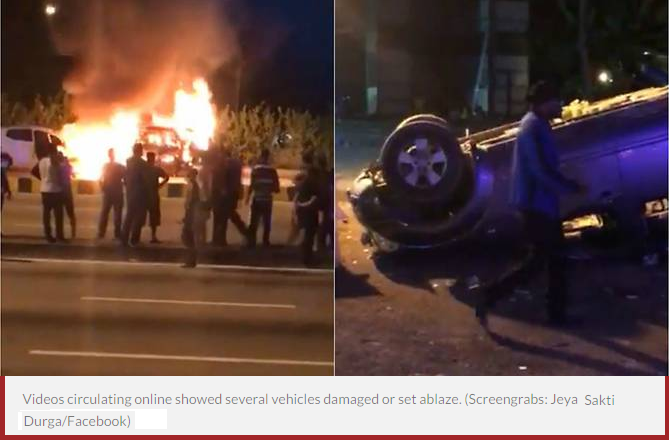 Surya Jeya Kumar| Selangor | Nov 27, 2018:: Vehicles were set ablaze when violence broke out near the Seafield Sri Maha Mariamman temple in Selangor’s Subang Jaya in the wee hours of Monday (Nov 26). The fight between two groups was sparked by a disagreement over the relocation of the Hindu temple, Subang Jaya district police said in a Facebook post. 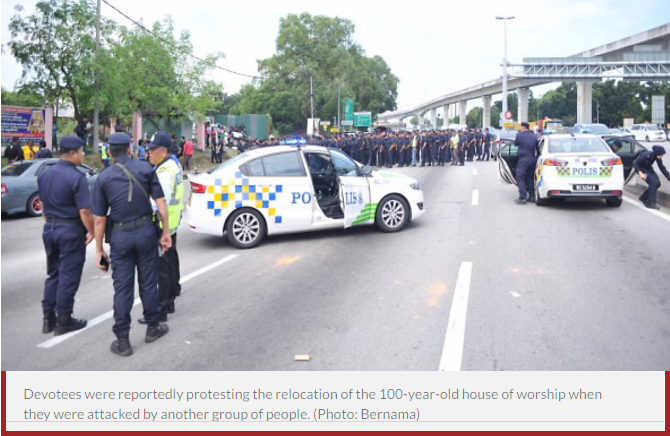 Hindu devotees were reportedly protesting the relocation of the 100-year-old Hindu house of worship when they were attacked by another group of Muslim people, news portal Malaysiakini said. “Eighteen cars and two motorcycles were torched in the incident. A police patrol car was also damaged by stones thrown during the incident,” said Selangor police chief Mazlan Mansor. “About 50 men were in the compound of the temple and a group of men was outside. They traded insults that led to the riot,” he added. Police has taken control of that area tough came a little bit late, as local people reported. 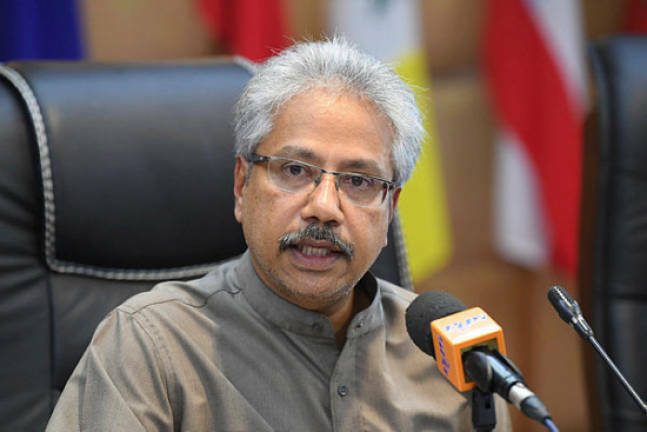 Minister in the Prime Minister’s Department Senator P. Waytha Moorthy has appealed to all Malaysians to stay calm over the scuffle at a Hindu temple in USJ25 early today within the jurisdiction of UEP (United Estate Projects) Subang Jaya. He said upon receiving various Facebook postings and video recordings on the incident at the Sri Maha Mariamman Temple, he contacted Deputy Inspector-General of Police Tan Sri Noor Rashid Ibrahim, Bernama reports. “The minister has raised grave concern of the community on the affray which appears to be a threat to the breach of peace and peaceful co-existence of our multi-racial and multi-religious society as well as freedom of religion,“ said a statement issued by the Office of the Minister in the Prime Minister’s Department. The statement said the Deputy IGP has promised that a thorough investigation would be conducted on the incident. In SHAH ALAM, Selangor Mentri (Minister) Besar Amirudin Shari said the matter should be left to the police to investigate as it involved a crime, AMAR SHAH MOHSEN reports. “It is best that we give our full trust to the police to investigate the motive behind the attack and what actually transpired. “This involves crime and as such, I advise that everyone refrain from making statements, or take actions, that can lead to unwanted scenarios,“ he told reporters at the lobby of the Selangor state legislative assembly, here, today. In GEORGE TOWN, Penang Deputy Chief Minister II Dr P. Ramasamy called on the local authorities and developers throughout the country to find ways to ensure that their development projects can co-exist with Hindu temples, IAN MCINTYRE reports. Ramasamy, who is DAP central executive committee member, said that there needs to be a better way to settle disputes over the locations for places of worship, especially if the place of worship was established earlier than the proposed development project, he said in an interview. Ramasamy, who plans to visit the site of the unrest, said the Pakatan Harapan government needs to make it a point to ensure that the co-existence of places of worship with new projects becomes a working policy. 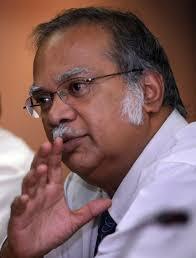 “I am aghast over the incident, especially coming under the Pakatan tenure. We need to offer a solution to all parties,“ he said. Meanwhile, the Malaysian Hindu Sangam (MHS) called upon the Hindu community to remain calm and not to retaliate with violence. Its president Datuk R. S. Mohan Shan condemned the violence and urged Hindus, temples and Hindu non-governmental organisations to lodge police reports nationwide. The Malaysian Consultative Council of Buddhism, Christianity, Hinduism, Sikhism and Taoism (MCCBCHST) also echoed Mohan’s sentiment and condemned the attack. “The MCCBCHST calls upon the police to leave no stones unturned in bringing to justice all those who were involved in this ugly incident. A source in MCCBCHST says,the Indian Jihadi Preacher Zakir Naik, now in Malaysia, is radicalizing the Malay Muslims youth against the Hindus residing there. Zakir Naik has established an internal connection with many Muslim Ministers, Politicians, Administrators and Police Officials in Malaysia, who treat Hindu Citizens of Malaysia as second class citizens. In the meantime, Devotees held special prayers for victims injured in Sri Maha Mariamman temple temple fracas+ in USJ. ___inputs from The Sun Daily | ChannelNewsAsia | Malaysiakini | FMT. This entry was posted on November 28, 2018 by hinduexistence in Anti-Hindu, Attack upom Hindu Temple by muslim, Attack upon Hindus, Attack upon Hindus by Muslims, Hindu Protest, Hindu Religious Issues, Hindu Retaliation, Hindus against Jihad, Islamic Aggression in Malaysia, Islamic Menace, Jihad in Malaysia, Persecuted Hindus and tagged Dr P. Ramasamy (Dy CM II Penang, Islamic insult on Hindu temple in Malaysia, Malaysian Hindu Sangam (MHS), MCCBCHST, Muslim Communalism in Malaysia, Sri Maha Mariamman temple in Selangor under threat, Violence breaks out in a Temple row in Malaysia, Zakir Naik in Malysia.